MOSCOW (AP) — An underwater drone armed with a nuclear warhead powerful enough to sweep away coastal facilities and aircraft carriers. Putin unveiled the stunning catalog of doomsday machines in his annual state-of-the-nation speech, saying that Russia had to build them to counter the potential threat posed by the U.S. missile defense system. And in a touch of dark humor, he invited Russians to join a Defense Ministry contest to name some of the weapons. Pentagon spokeswoman Dana White also said the Defense Department wasn’t surprised, adding that the U.S. military is prepared to defend the nation. White told Pentagon reporters that U.S. missile defense has never been about Russia. Washington has consistently argued that missile defense systems in Europe aren’t aimed at Moscow but designed instead to defend against threats from Iran, North Korea and rogue threats. 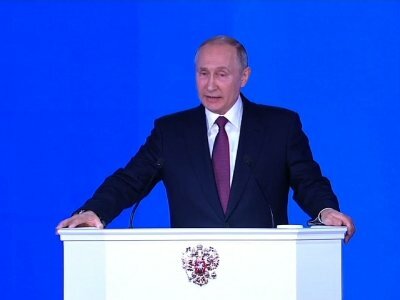 Putin said the nuclear-powered cruise missile, which was tested last fall, has a “practically unlimited” range, and its high speed and maneuverability allow it to pierce any missile defense. The weapon is capable of performing sharp maneuvers on its way to targets, making it “absolutely invulnerable for any missile defense system,” Putin added. Tom Plant, director of proliferation and nuclear policy at the defense think-tank RUSI, also said he was not sure how much of the announcement to believe. To complete the list, he mentioned a smaller hypersonic missile that is already operational and has a range of more than 2,000 kilometers (1,250 miles) and a new laser weapon.